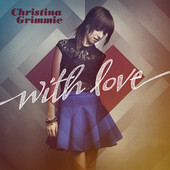 Perhaps the most famous YouTube cover star of them all, Christina Grimmie's second full length, With Love, made its full debut. Her debut album, Find Me, garnered mixed to positive reviews and a No.6 position on Billboard's Independent Albums and No.35 overall. How will this album fair reception wise on Critic of Music? Read on to find out. As a whole, Christina had some goods, and some bads with this album. The missteps include putting 4 songs back to back that sound the exact same, not using her notorious piano enough, and putting the best tracks at the back and forefront, making the middle half nearly unbearable. However, there were its fair share of good steps, with some super catchy pop songs, and gorgeous acoustic tracks, Christina showed a bit of versatility and maturity. For the next album, drop the 60's, its not you Christina. Keep the great pop songs for your fanbase, and add more acoustic tracks for your fanbase, and for some further appeal. Overall, a massive improvement from Find Me, but there is still work to be done.